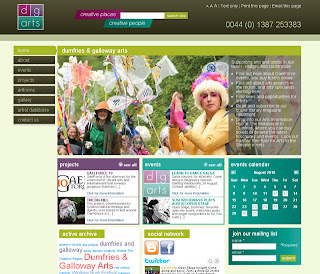 The events calendar on dg Arts homepage arose out of some ics file experimenting with The Events Calendar (Wordpress Plug-in), Google Calendar ics feed import, and ICS Importer plug-in (which basically brings the feed back into the Wordpress system and outputs it in a much customised calendar. This will update automatically to include new events as they are added by dg Arts staff. New events are automatically included in ics feed and on the website events page. The ics feed updates the dg Arts public Google Calendar which feeds back to the calendar on the website every few hour by supplying an external ics URL.